Flip your work upside down. The curved side is up and the long elastic strap is on your right. Piece #6 will be placed on top of #8. 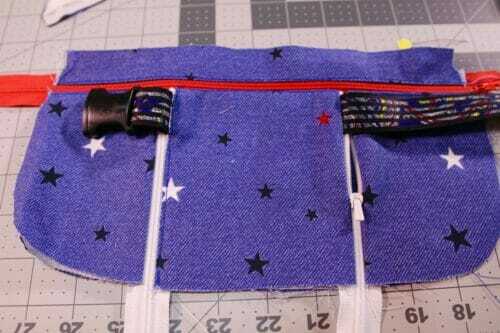 Align with the straight edges and the zipper tape. 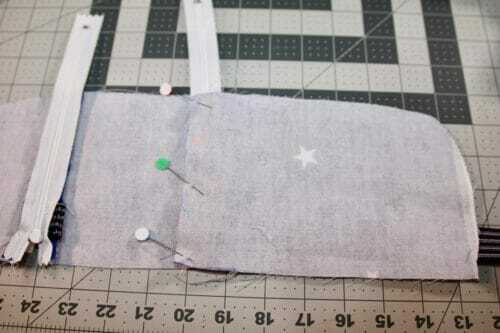 Pick up the work by the zipper edge and take this to the sewing machine and sew. You will need pieces #5, #4, one of the 14″ zippers and the rest of the work that we assembled above. Remember that pieces #5 and #4 are from the same pattern piece but cut twice. Place piece #5 print side up flat edge to the top. Place the work you've done so far on top. Pin together making sure the zipper tape is straight. Flip your work to make sure it all lines up. I suggest you zigzag the top to keep the zipper tape straight. Pinning sometimes is not enough to keep layers together. 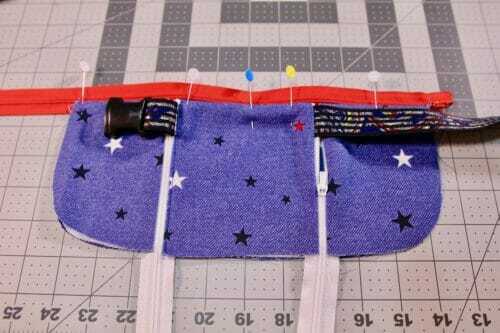 Place the 14″ zipper right side down. Align with the top edge of the running belt. 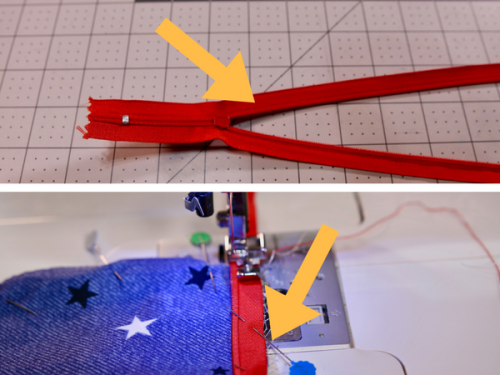 Change the top thread of your sewing machine to match the zipper. 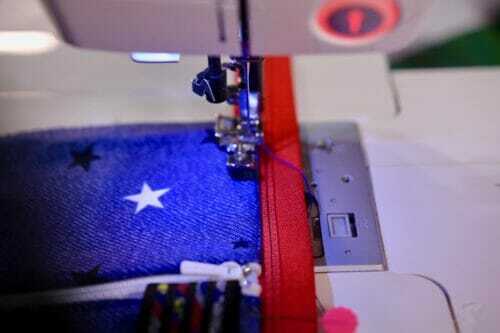 Sew the zipper down. 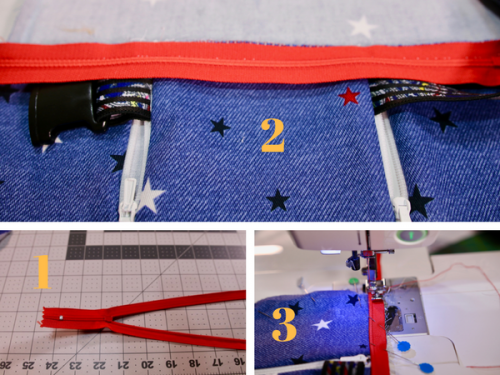 Change your machine needle to match the fabric of the pouch. Make sure your work looks like the picture below. Pin the fabric all together folding the seam allowance towards, the fabric. Topstitch from the left to right and from right to left. Stopping both times at the buckle. Topstitching from left to right use your right side of the zipper foot. 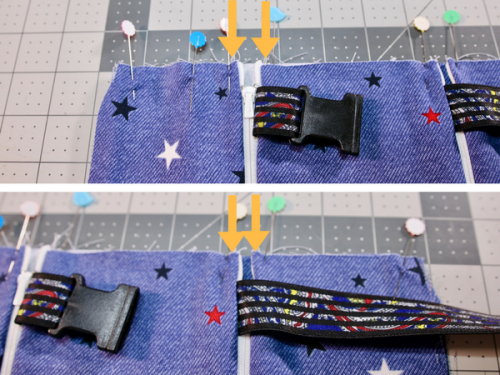 Reverse this step from right to left, this means you have to use the left side of the zipper. I do not have a picture of this, but I think you get the picture. 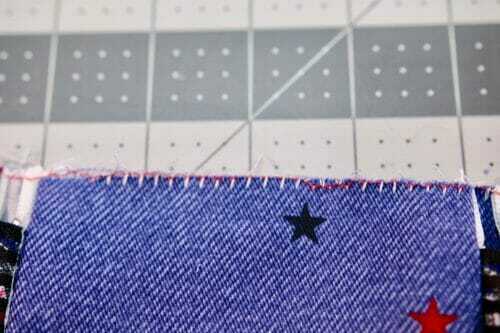 This topstitching will let the zipper lay flat. 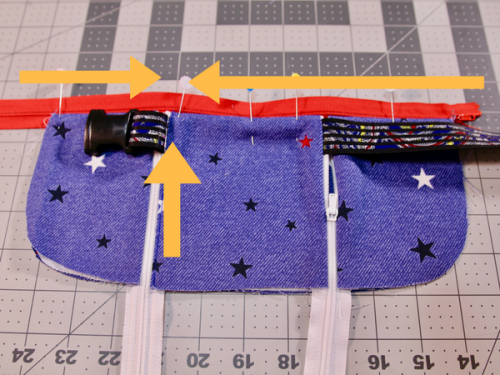 Check that your seam allowance doesn't show behind the zipper tape. If it does, trim it flush. Thanks for the pattern. From the photos, I am guessing this finishes at about 11 x 7 inches? I think this is a great item to have. It frees up your hands when shopping or traveling. great pattern. How do I obtain the tutorial for the instructions to make. I have already downloaded the pattern. Hi Patrica, you can just follow the instructions from the website. It works well if you have an iPad or some form of a tablet. Otherwise, you can use a laptop. Happy sewing! This looks great thank you so much. Can the vertical zips be undone whilst the belt is fastened? I did that un purpose to stop pickpockets. Depends how tight your belt is, you need to push your fingers inside to be able to do it. I have never been robbed with this belt. Thank you so much for an awesome pattern! It is my pleasure Dawn! This is exactly what I am looking for for an upcoming trip to Europe!! Can’t wait to get it cutout and sewn!! Thank you!! Thank you for this pattern. It looks like the elastic is covering the top of the zippers on the two front pockets. Is that correct? Seems like that would make it difficult to unzip and get stuff out of those two pockets without removing the belt completely. I’m hoping for a money belt I can wear under my clothes and just hike up my shirt and get things out any pocket without having to remove it. Will that work? The two little pockets are good for a folded bill,a card or perhaps one key nothing else. I use it to hide emergency cash and my house key. 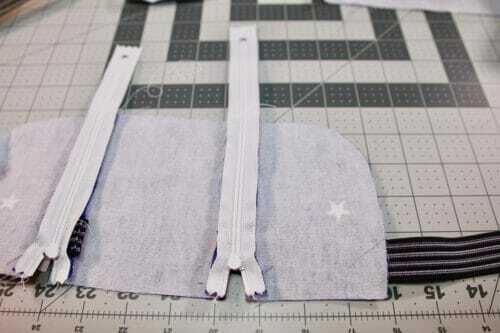 You can easily modify it by sewing the elastic so it exposes the head of the zipper. (I tend to be paranoid about leaving the house without a key and a bit of cash)The pocket with the zippers in read is where you can stash money and a phone. It lays flat which is what I was looking for, if you want more bulk check out the belted pouch it looks good both in fabric and vynil. Hope that answers you question. Thanks for the reply. I’m now at the point where “piece #6 will be placed on top of #8. 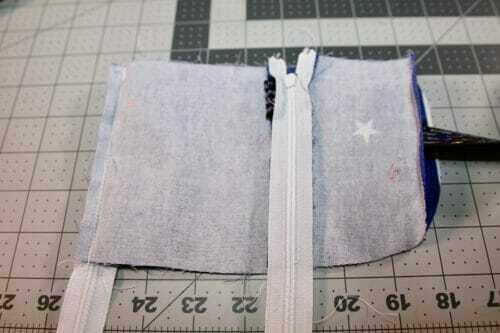 Align with the straight edges and the zipper tape.” The photo directly below that instruction shows the number 5 written on the back of the fabric (not #6). Also, my piece #6 extends all the way over piece 8 to the left edge of the second zipper. In your photo, it only covers piece 9 up to the zipper on the right. (hope that made sense). What am I doing wrong? It looks like you have labeled the pieces incorrectly, could you go back and look at what you have done? You need to work backwards from piece #9. I cut those pieces in addition to the pattern pieces as instructed, but never used them. I didn’t see anywhere in the instructions where it called for them and my belt is complete. For future reference, where were they supposed to be used? Hi Imajean, thanks for letting me know, I sometimes recycle the template of the instructions. That is why I no longer add the instructions on the PDF. I don’t think anyone understand how long a pattern take to make and share for free. Happy that the belt pattern worked out for you. Now you have material for a pair of handles for a tote bag. I have a few patterns around, for free as well. Hope you have enough fabric for a tote bag. yes that was a mistake on the making of the PDF, I have a VA and sometimes she takes another template of a post and used it but forgets to take this line of. I will amend the post so people will know they are not supposed to cut this straps. Don’t worry though the strips are the perfect length to make a very nice pair of bag straps. Hi Ishka, you tack where the elastic meets the fabric to make sure the elastic won’t move up and down when you run. It is very nice the belt you have made, and yes it is only for carrying the phone, some coins and bill or cards while you are running. I made this belt for my 2 1/2 years old grandson, so he can take his dinky toys everywhere he goes. What a great use for this design. Thanks for sharing the idea. This pattern turned out really well! I used narrower bias tape and cut two of piece number one because I wanted a bright colored lining for the back zipper pocket. Thank you, Mayra, for the nice pattern. Cant find how to download the pattern. Thanks for help. HI Malin it is on page two. I thought you might find it amusing to know that the acetate fabric at Amazon.ca is $66.46 for a metre! I would use the fabric from a broken umbrella. Wow, that is a lot, any chance you can find it in a local market? ohh this is just what I need! Thanks so much for the pattern! I am possibly overthinking this thing? When I place the consruction of pieces 6-9 on top of piece 5, there is a difference in height of about 1/4″. This corresponds to the broken line on pattern piece 4/5, so I am assuming this is deliberate – but how should I be matching things up? HI Elizabeth, yes you are right, do not overthink it. 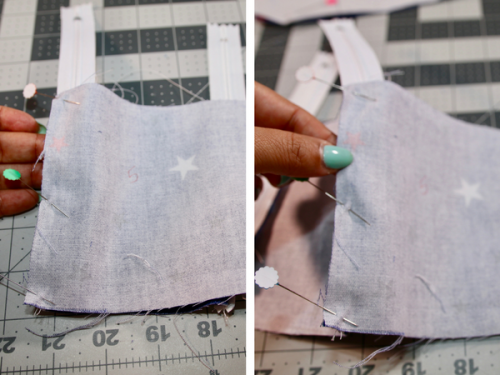 The pieces will align better once you sew. The pattern has the seam allowance the (1/4″) included so stacking the pieces on top of another will throw you out a bit. There is a zipper on top of #5. Hope this helps! Thank you for the free pattern I have read through the instructions and have the material I will be using. I just have to get the hardware and the elastic. I grew up with fanny packs, but the ones you can buy in the store now do not fit my very full figure, so making my own and having it be a thinner pack will be great for my travels this summer!! Enjoy Patti! Enjoy your summer! Do take a picture using the belt no matter where you are, it is still at 13,000 miles from me, so for me will be a treat to see your country. Have you flossed your tension discs on your machine? There could be thread bits stuck in there. 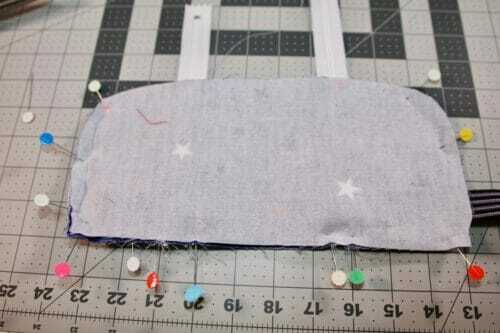 Just use a folded, kind of stiff piece of thinner fabric and run it up and down your tension discs. Or you could use unwaxed dental floss or a crisp dollar bill. Hopefully that will fix your tension issue. Never thought of that! Trying it as we speak, thank you will let you know if that did the trick. Oh yes, I remember fanny packs. Much bulkier. This looks perfect for travel and also for those outfits that don’t have pockets (I just hate that, too!) I know I should just add pockets, but sometimes there is no right spot for them. Thanks for this. Hi Myra, I had that tension issue on my singer sewing machine too. got so frustrated with it that I actually quit sewing for a while. then I remembered the sewing machine shop in town and took it in for a tuneup. for about a third of the cost of the machine it is now running like new again. something I’ll have to do every 2-3 years but is much better than chucking it out and buying a new one. Thank you, this is wonderful. I did not get the instruction for the lining part. 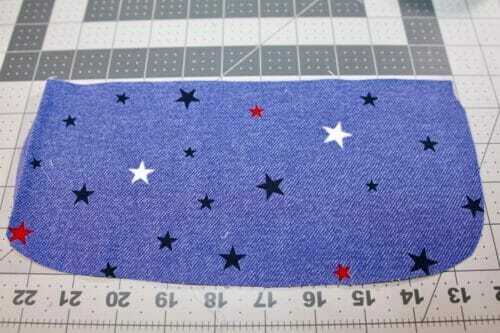 Do we cut a lining piece from each pattern piece? HI Cheryl, there is no lining being used in this travel belt. would you be inquiring about the pleated skirt sewalong? Thank you for the pattern and for all the great patterns and tutorials that you generously provide on a regular basis. I love ? your site!! You are most welcome Chris! Hi Vickie, it is on the second page, under the Pinterest button. Enjoy! Sorry about your purse. I got the pattern by signing in with facebook. Thanks so much for all the help. Hi Tesa, I am using a Juki, it is 1.5 years old, it shouldnt be happening so soon. I did not know about the that on Brother Machines, will investigate further. I am starting a walking regimen, and I use my phone for music, to count my steps & my heart rate. I sweat so bad I hate having it on my arm, this will be sooo much better. I like thinner material – not see thru – I’m not there – never will be, but so wind can keep me cool as I do need full body coverage, this will work great to hold my phone a little money 7 maybe I can figure out a way to snap on a water to the band! Thank you!! That sounds like a great addition to the belt, do let me know how you improved the belt, I am curious. I think it is a good idea no matter what you call it! That’s so funny, when I was growing up, they were called fanny packs! Hi Victoria, I certainly grew up with fanny packs as well, but they were generally a bit thicker and not necessarily meant to go smoothly under your t-shirt or another outer garment. This money belt/travel belt/sports belt is much thinner and serves a different purpose than most fanny pack I think. Thanks in any case for the comment and kind regards.